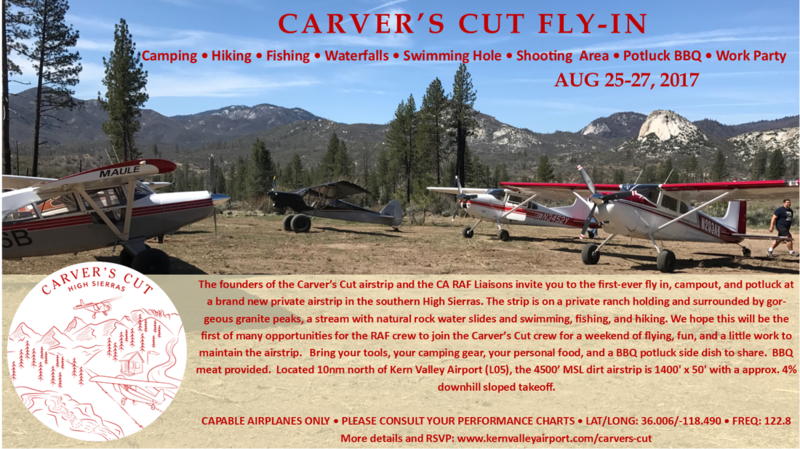 The founders of the Carver’s Cut airstrip and the CA RAF Liaisons invite you to the first-ever fly in, campout, and potluck at a brand new private airstrip in the southern High Sierras. The strip is on a private ranch holding and surrounded by gorgeous granite peaks, a stream with natural rock water slides and swimming, fishing, and hiking. We hope this will be the first of many opportunities for the RAF crew to join the Carver’s Cut crew for a weekend of flying, fun, and a little work to maintain the airstrip. Bring your tools, your camping gear, your personal food, and a BBQ potluck side dish to share. BBQ meat provided. Located 10nm north of Kern Valley Airport (L05), the 4500’ MSL dirt airstrip is 1400' x 50' with a approx. 4% downhill sloped takeoff. New friendships, bonfires, tall stories and good times guaranteed! THE AIRSTRIP: Located 10nm north of Kern Valley Airport (L05), the 4500’ MSL dirt airstrip is 1400' x 50' with an approx. 4% downhill sloped takeoff towards the south. There is a windsock at the south end of the airstrip. If you need to land at Kern Valley Airport (L05) and get shuttled up, please call ahead of time to make arrangements. 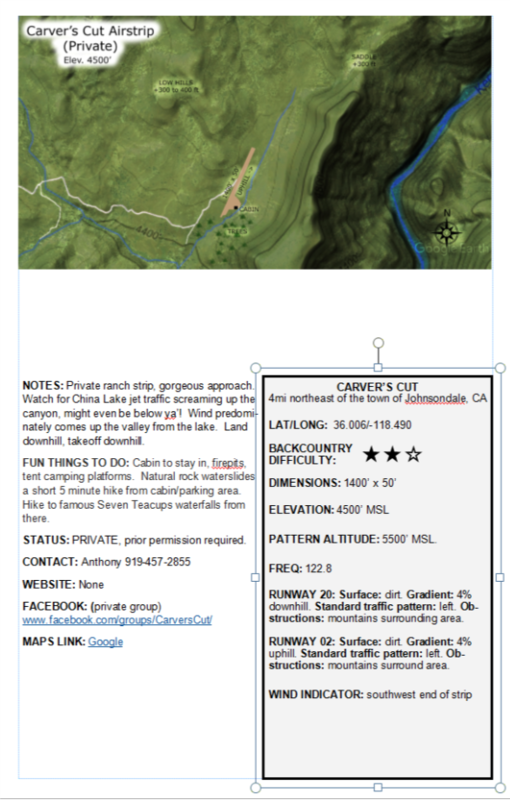 UPDATE: So far we are planning a Saturday mid-morning shuttle up from L05 to Carver's Cut for some guys flying in that day. THE AMMENITIES AND ACCOMODATIONS: Carver’s Cut airstrip has a cabin, toilet, shower, kitchen, BBQ, covered kitchen and eating patio, and tent platforms and open space to camp. There's a shooting area near the cabin, a swimming hole, the famous Tea Cups Waterfalls, hiking, fishing in the creek, and natural rock waterslides. NOTE: We have reserved an extra large cabin at the ranch down the road with lots of twin bunks if you prefer to stay there ($20/person/night), if so bring your own twin-sized sheets. There is a large pool and two jacuzzi's there. Please call Anthony ahead of time to make arrangements. THE PLAN: We'll be hanging out, working on finishing the cabin, mowing the tiedown area, swimming at the swimming hole, hiking down to the water falls, having a bonfire, maybe doing some shooting, maybe shuttling into town if need be. The main potluck BBQ will be Saturday night and we'd like to have everyone bring a side dish we can keep in a cooler on ice for the meal. For breakfast Saturday and Sunday, pilots are welcome to fly ten minutes down the valley and eat at the cafe at Kern Valley Airport. Food: bring breakfast and lunch foods, though for breakfast Saturday and Sunday, pilots are welcome to fly ten minutes down the valley and eat at the cafe at Kern Valley Airport. Also, bring a Saturday night BBQ potluck side dish to share. We will have some coolers and ice to store food in. The PIC bears the ultimate authority and responsibility for safe and approaches and departures from the airstrip. Watch the video at the top right of this page before flying in. Use a typical backcountry pre-landing checklist to circle and carefully assess the situation on the ground, such as possibility of cattle in the vicinity, number of planes on the ground, parked or moving and to determine their abort point and abort path. If the winds so favor it, landing uphill will require an earlier abort point due to rising terrain. Typical morning canyon wind pattern: flowing lightly down-canyon during the very early morning hours then reversing and flowing up-canyon from Lake Isabella with gradually increasing intensity as the daytime temperature goes up. Afternoon winds have been very often out of the south in the canyon and variable south to southwest at the windsock. Maybe 5 or at most 10 degrees off the strip, with some variability in magnitude. The south wind creates an amazing amount of lift off the south slopes of the flat-top east of the strip. 1) Early morning landings: Heavy airplane guys might anticipate the wind would still be flowing down canyon and land Runway 02 (uphill), but with the uphill landing, your go-no point should be picked slightly earlier in anticipation of applying go-around power in the slight uphill direction.. This would give the benefit of both a slight headwind and an uphill slope to reduce ground roll. Light airplane guys typically land downhill (Runway 20) as the slope is gentle enough that they are stopped and slowed in 70% of the strip with minimal braking. And they have the go around option until touchdown practically -they have much less go around option going uphill due to low horsepower. 2) Afternoon to late-afternoon landings: Bearing that the typical up-canyon winds are flowing up from Lake Isabella, land downhill (Runway 20) as the slope is gentle enough and headwind strong enough that you will be stopped and slowed in 70% of the strip with minimal braking. This also gives the downhill/down-canyon go-around option until touchdown.